That’s all that’s standing in the way of the all-new, all-deadly Injustice Society of America. Welcome to “Die Hard” in the JSA brownstone. In “JSA” No. 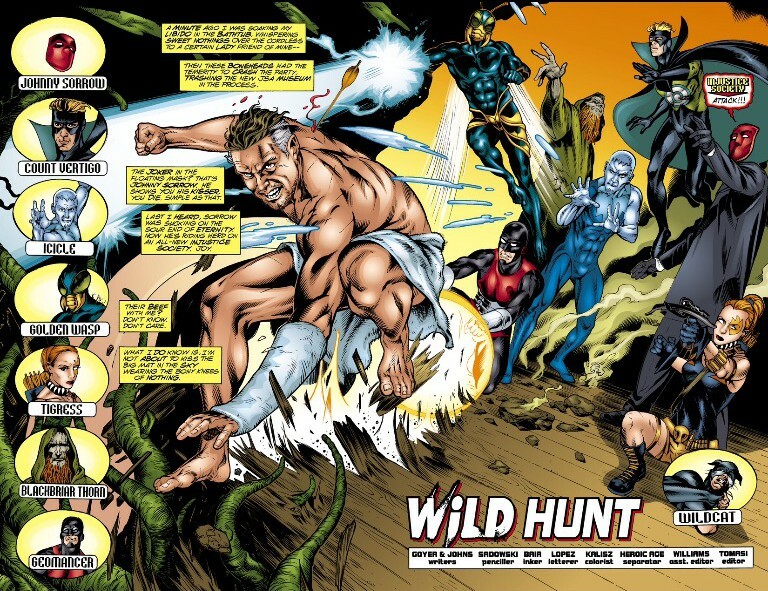 10, “Wild Hunt,” cover date May 2000, written by David Goyer and Geoff Johns and illustrated by Stephen Sadowski and Michael Bair, one lone member of the Justice Society of America – Wildcat – must take on the combined might of the re-formed Injustice Society of America. What follows is not only a lightning-fast adventure reminiscent of a big-screen action blockbuster, but a story strewn with Easter eggs of all sorts for readers new and veteran alike. The Injustice Society interrupts bath time, the fiends. 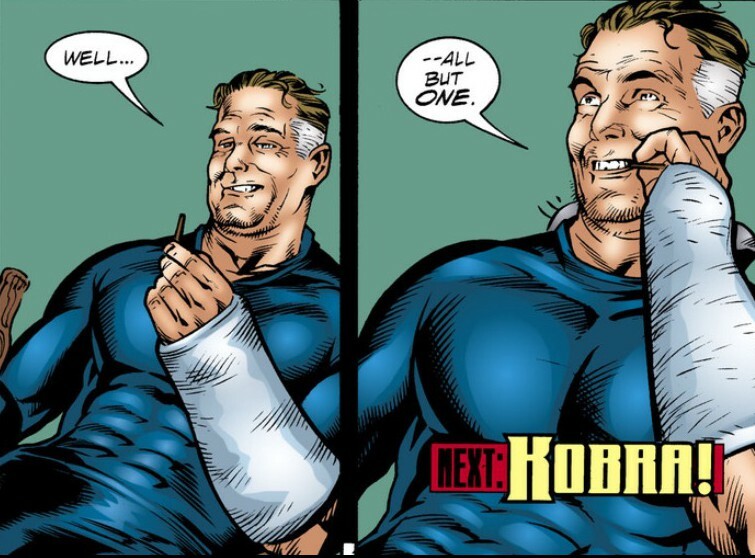 In addition to being nearly naked when the super-thugs break into the mansion during his bath time, prizefighter Ted Grant also has a broken arm. Obviously, this fight is going to be a massacre. These villains don’t stand a chance. Wildcat narrates the action, a savvy choice on the part of the creators, as we get the full brunt of his determination and bravado facing these super-powered thugs. You can almost imagine his part was written for Bruce Willis. 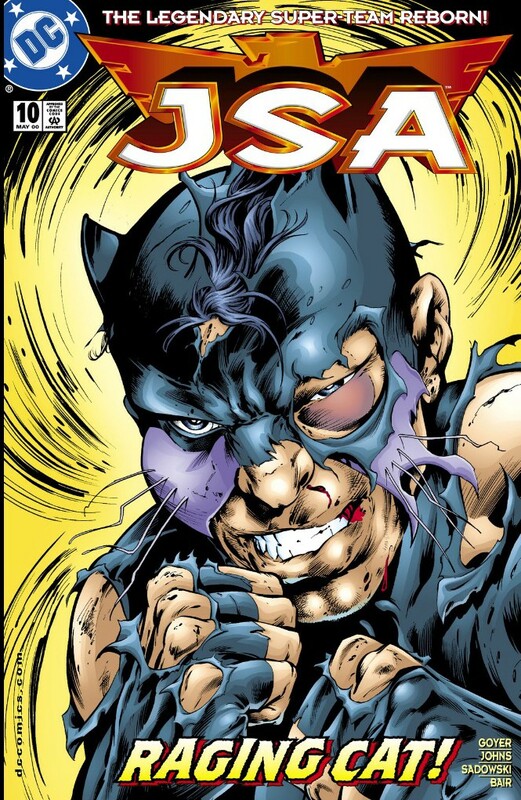 He uses his knowledge of the JSA mansion, his cunning and his fighting prowess to take out Count Vertigo, Golden Wasp, Tigress, Blackbriar Thorn, Geomancer and Icicle. He retrieves his costume, roars out of the shadows on a motorcycle and clobbers Vertigo. When the bees of Red Bee attack! He sends Geomancer tumbling down a floor, smack into the “Living Bee Hive” commemorating the Red Bee. I just have to stop here and marvel: The JSA chose to honor the memory of a minor All-Star Squadron hero who fought crime with a couple of trained bees with an exhibit of live bees. This is cool and crazy, and you know you just want to explore the JSA mansion all day. We’re in luck, because Wildcat is tearing up the place. He corners Icicle in the hospital ICU and dropkicks him onto an operating table for a little “noninvasive automated laser surgery.” OK, this isn’t “American Horror Story,” so let’s keep this moving. That’s no throwaway line. In “JSA” No. 42, cover date January 2003, Michael Holt/Mr. Terrific and Hawkgirl make a pitstop in the 1940s and meet the original “man of 1,000 talents,” Terry Sloane, who has a creative way of defeating Black Barax. And what happens if someone sneaky turns off the controls? Blackbriar Thorn plummets and becomes a pile of twigs. When a Tornado hits, run. Tigress still thinks she has a chance. That’s cute. 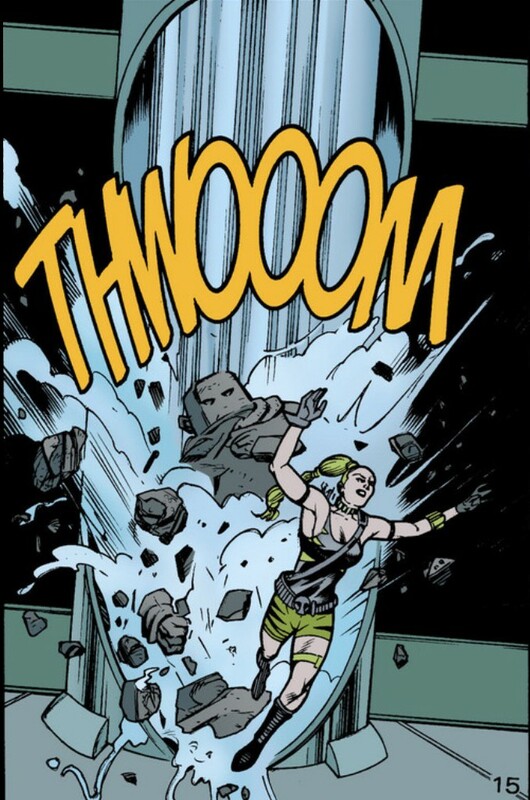 Wildcat sends a statue of the original Red Tornado, smashing her way. The statue is destroyed, but be heartened: Somebody up there remembers Ma Hunkel. Tricking the Golden Wasp into using his electric stings against Tigress, Wildcat challenges his foe. “You wouldn’t last five minutes in a good old-fashioned knuckle duster,” he says. Wildcat knocks him out with a solid right hook. Johnny Sorrow appears for one last taunt, as super-villains love to do, and teleports his unconscious minions away. Wildcat uses Blackbriar Thorn – or at least part of him – as a toothpick. Is this a violation of his Miranda Rights? This issue marked a critical creative turning point. As a lifelong fan, I was wary about this reboot of the JSA. The comic was closing in on its first year anniversary and hadn’t done much to distinguish itself from the other team books on the market. Here, the creative team finds its stride. One thing was certain from this issue: The Golden Age of the Justice Society was beginning. Introducing – again – Mr. Terrific!